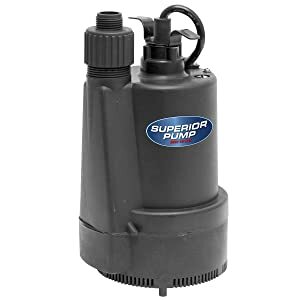 The Superior Pump 91330 is a multipurpose utility pump constructed with heavy duty thermoplastic which makes for a light yet durable pump and also makes it corrosion resistant. The pump packs 1/3 HP and comes with an energy efficient but powerful 4.1 Amp motor which helps pump as much as 28 gallons per minute at 10 feet of discharge lift. In addition, the pump has a bottom screen that stops chunky debris from flowing into the pump housing and damaging the internal parts. The pump can remove water up to ½ an inch off the floor. It has a 1-1/4” discharge and comes with a garden hose adapter for use in multiple applications. This is a great, portable multi-purpose utility pump. It is energy efficient and removes a sizeable amount of water per minute. 40 Gallons per minute is a lot for a pump of this size. It is super efficient and super quiet. It is rated for continuous duty but it can be used as a back up pump in times of emergencies. It is an extremely versatile pump that comes with high recommendations. This sump pump works best for most residential and light duty commercial applications. Be it to drain water off the pool cover of an above ground pool or to flush out the water in a tankless water heater for routine maintenance or to transfer water from a source to a storage tank some feet away. It is designed to handle it all without too much hassle. The pump has a thermoplastic casing, which protects the impeller; motor and other parts from impact but more importantly, from corrosion. The thermoplastic material also makes the pump lighter and easier to carry around. While not sturdy as some other pumps out there, the thermoplastic housing is actually well matched to the fairly small motor this pump is fitted with. One of the first sump pumps you had might have been noisy but you’d have gotten used to it. The pump has been found to be quiet in most applications so you don’t have to put up with distressing noise that most sump pumps are known for. Some users in their sump pump reviews state that the pump was so quiet they wondered if it was functioning. It is a small portable pump that has a powerful motor with an energy efficient rating of 4.1 amps. It has the capacity to pump 40 gallons of water per minute to a maximum vertical lift of 25’. The flow can be adjusted by using the garden hose adapter. The finely meshed filter cap and the impeller design allows it to stop larger debris from blocking the flow and pass through smaller debris from clogging the pump. The pump is great at moving freestanding water like water on pool covers and flat roofs. To use it as a sump pump, the sump pit should not be too deep to compensate for the poor head capacity and a float switch might have to be added to enhance the pump’s performance. The pump is designed to be a submersible pump however it cannot be used without supervision. It works great as a pool cover water remover. The maximum pumping capacity of 40 gallons per minute can only be reached when there is 0’ lift which makes it a mediocre sump pump. It can be used as a submersible pump but not to great lifts. The electrical cord tends to lose its flexibility in cold conditions. Some reviews point out that the pump works great as long as the cord doesn’t get wet. This is one of the top contenders in its class and offers ultimate performance for a great price. Given its small build, multipurpose design, powerful motor, quiet operation, this little guy is a good fit for all those applications requiring fairly lesser HP.